That is what I find the sculpture like at the Toronto Botanical Gardens. I visited with a friend last week, when I was waiting for Ian to arrive from Barbados. 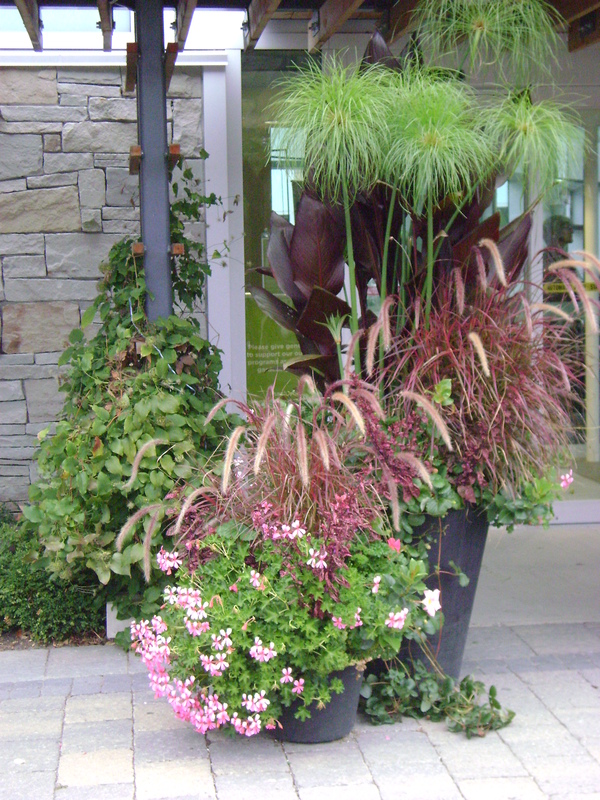 This ‘temporary’ art installation is made up of natural materials, either found at the TBG or gardens maintained by Landscape Ontario members in Toronto. 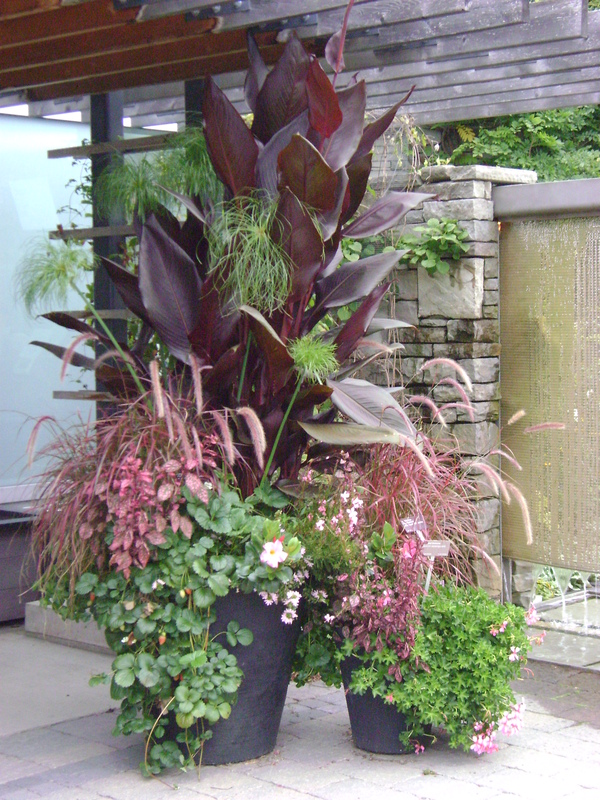 Designed by award-winning garden designer W. Gary Smith, it took over 300 hours by volunteers and staff at the TBG. I love it, whimsical, magical, it calls out to the child in me. What about you? I love copying, I am a thief of ideas, although my mother always said ‘Imitation is the most sincere form of flattery’. 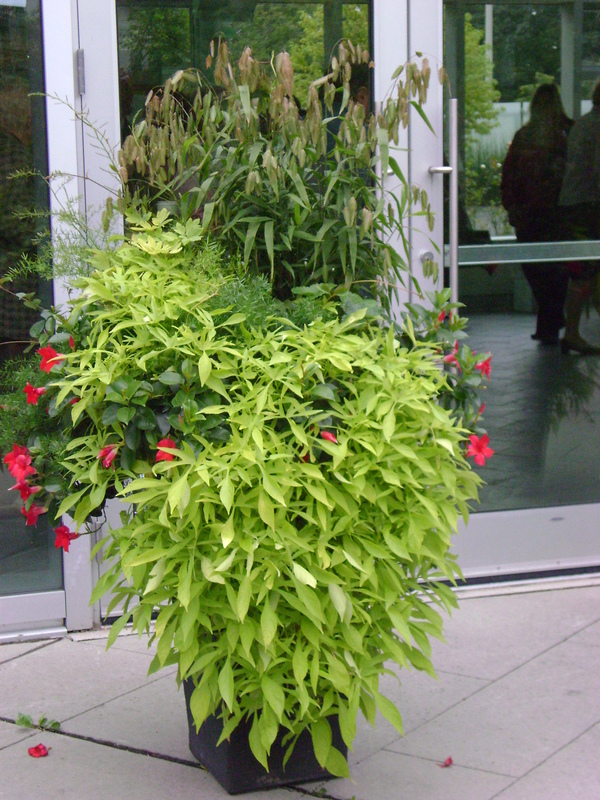 Here are a few ideas of spring urns at the TBG, that are worth copying. 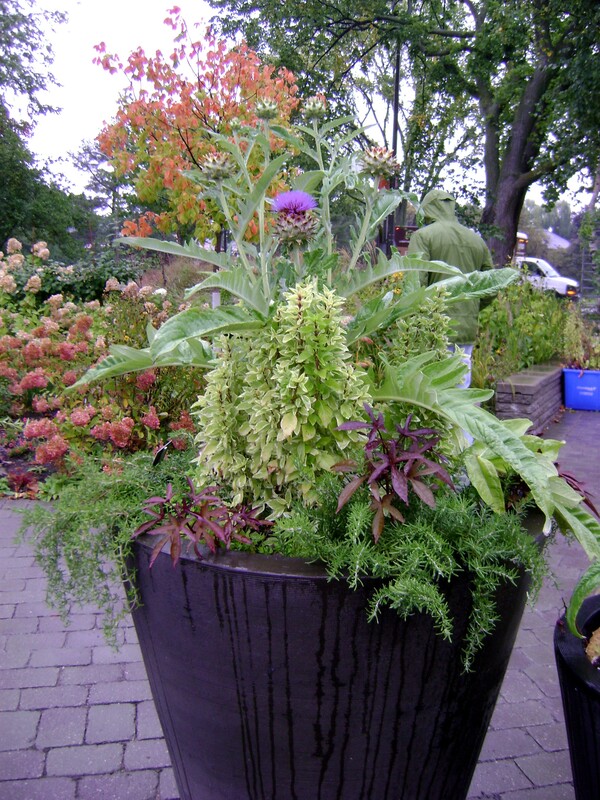 When I was working at East of Eliza flower shop, I had an order for a sympathy plant arrangement. I took a lilac in flower, would a flowering clematis up its stem, and added forget me nots and violas at the base. 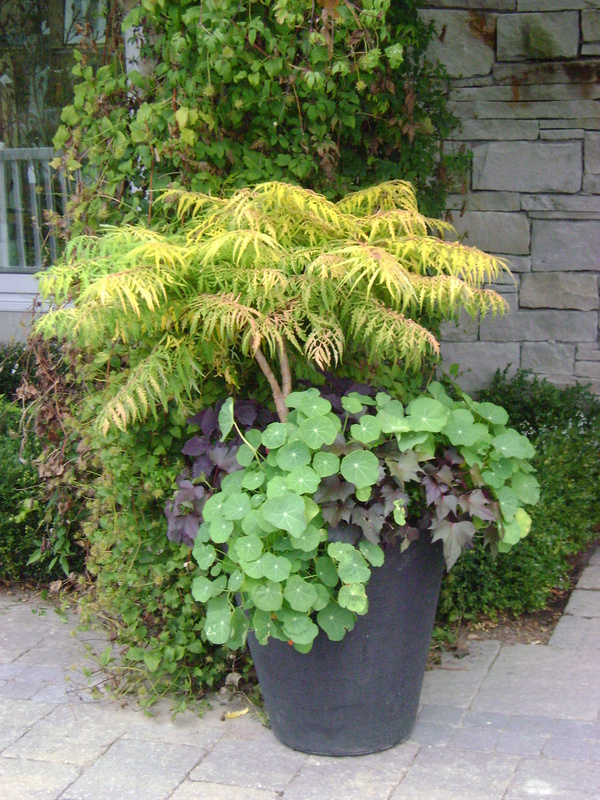 I love using trees or shrubs for height in containers, especially spring where the plants are shorter than those flowering later in the season. 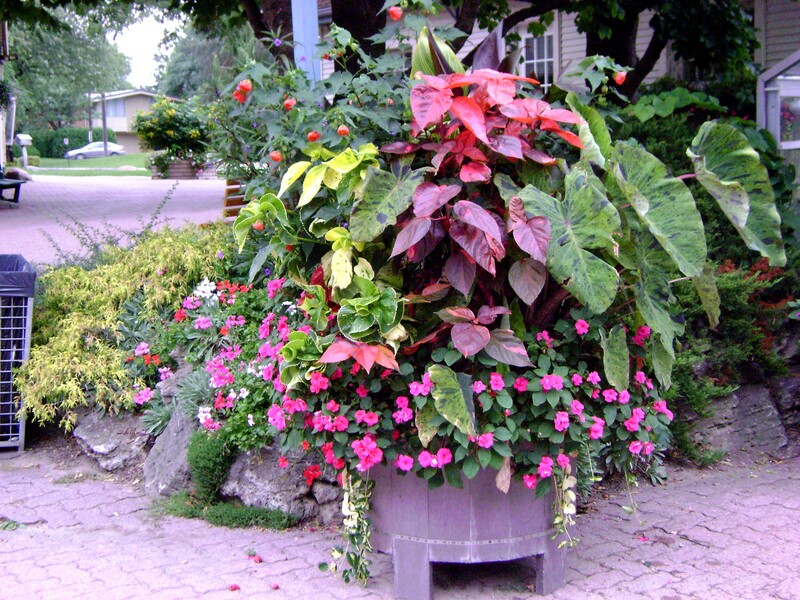 I can’t wait until I return to Canada full time, and I can have spring urns of my own. I have been at the Toronto Botanical Gardene twice this past week. The first time was Tuesday night, when I attended a lecture by Marion Jarvie with my friends Barry Parker and David Leeman. And the second time, this past Sunday, when ORGS (Ontario Rock Garden and Hardy Plant Society) had its annual plant sale. So I made sure to get out in the garden both times to take some photos, giving myself some inspiration and hopefully you. You walk through the woodland garden to get to the main building. I believe these are insect habitats, quite beautiful. nice to see a botanical theme. but mine have not started flowering yet. Obviously I need a lot more. 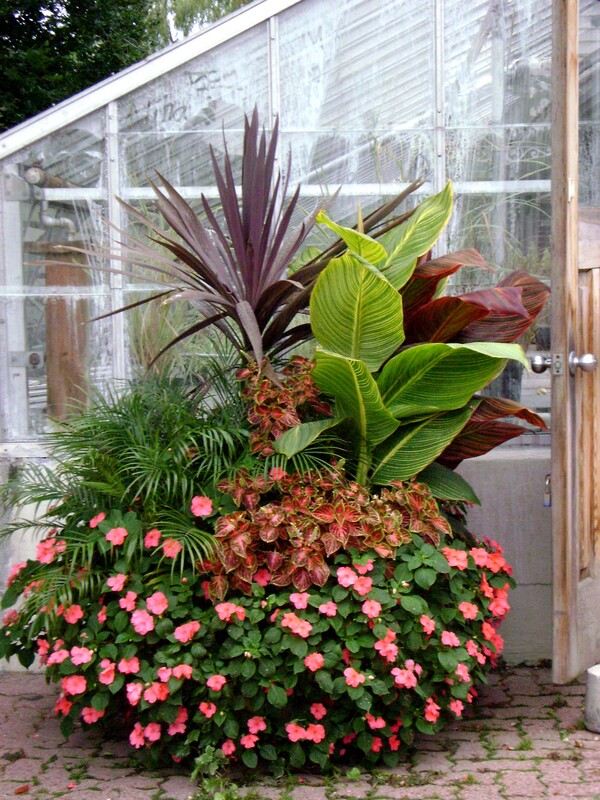 A couple of plant combinations I liked. The formal garden is looking quite lovely. I think this is tulipa sylvestris. And Acer shiraswanum ‘Aureum’, I bought one last year, lovely underplanting. I love redbuds, mine should be in flower soon. And I actually have a couple of seedlings, a group like this would look lovely on the berm. 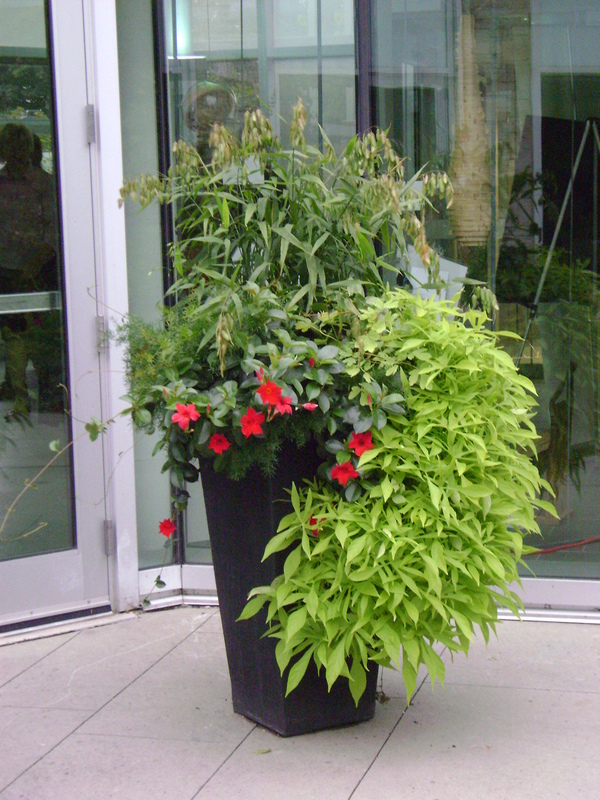 One of my favourite jobs at the very first flower shop I worked at was planting customers urns. It was a joy to go into the garden centre, wandering around and round, getting inspiration for their new scheme. But once it was planted up, I usually never saw it again, at least never in its glory. 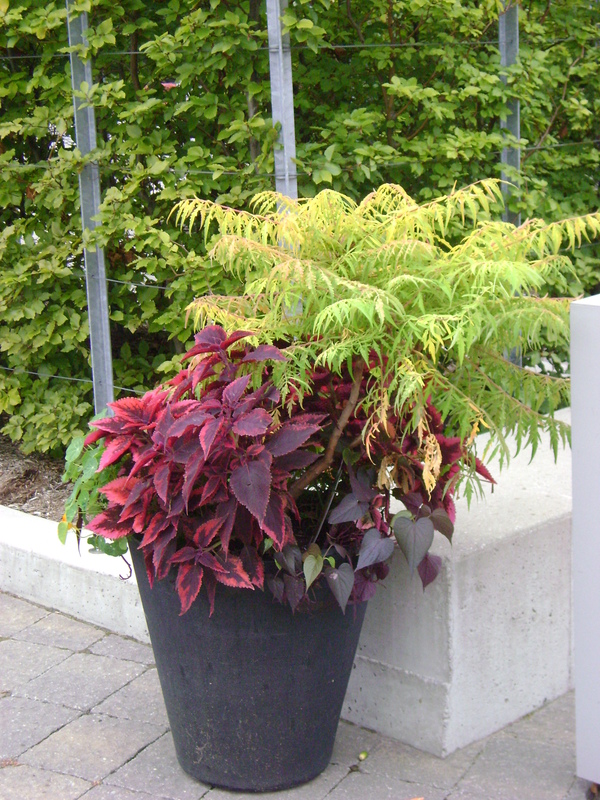 Sometimes after a frost, the customer would call us and have us plant them up for autumn, but those times were few and far between. These were my favourite, they were on either side of the front door. Love the pink and red combination. These two are beside the greenhouses. Veggies can be very ornamental. I am glad that I visited the TBG when I did, summer is over, and there are some cold nights to come, perhaps next time I visit, the urns will be in their Autumn wardrobe. If you are interested in seeing the 2009 urns, you can here.